Johnson's know that you need to protect your baby from everything harsh. Hence you go that extra mile to ensure that only the most gentle reaches her. Which is why, when it comes to her clothes, you soak them separately, disinfect & rinse thoroughly! But, did you know that disinfectants and regular-use detergents could be adding more harshness than what is being rinsed away? Thus, a detergent for baby clothes that promises the most gentle care is the ideal solution for any loving mother. Such a detergent for babies is formulated with a two-fold purpose - to clean your baby's clothes of any impurities, at the same time protecting her delicate skin from any external roughness! 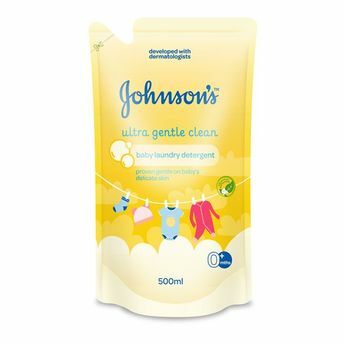 This Johnson's baby product is designed to ensure gentle cleaning of your little one's delicate clothes. Explore the entire range of Miscellaneous available on Nykaa. Shop more Johnson's products here.You can browse through the complete world of Johnson's Miscellaneous .